When seven talented artists come together, there's bound to be a difference of opinions. It's certainly the case for BTS who continues to have huge success thanks to their latest album titled Love Yourself: Answer. While the guys remain extremely tight, several members couldn't help but admit that every so often, there's a disagreement amongst the group when it comes to lyrics, choreography and songs. "We feel that we're pretty level headed and as you say, open, especially with the production team. So if we think something is not good, then we'll openly say it and we'll say let's change these things with our production and with each other," j-hope shared during "A Conversation With BTS" held at the GRAMMY Museum in Los Angeles. "So if there's a choreography, for example, and it feels like it'll be too taxing on our physical resources, it's going to be, you know, as I said, we're not getting any younger... Then we make those changes and we're always open about it." SUGA added, "We have mutual respect for each other and I think that's really important and good. We're always willing to listen to the opinions that the other members may have and we're always willing to change it. When somebody points something out, we don't say, why? Instead, we always try to focus on what can we do to make it better and make the change." One thing the group always agrees on is the importance of staying close with their fans. 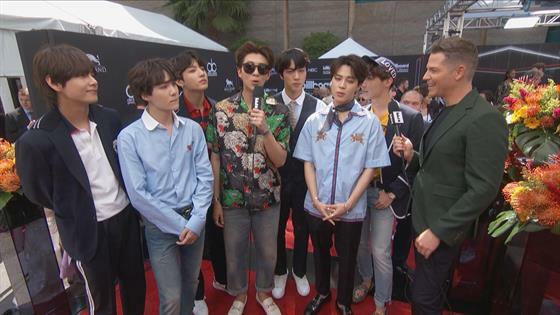 Earlier this month, BTS kicked off their North American tour with several sold-out shows at the Staples Center in Los Angeles. Their upcoming concert at New York City's Citi Field also sold out in nearly 20 minutes. "The fans gave us the wings that allowed us to be where we are and where we are now," V shared at Tuesday night's event. "So we are always thankful. We know that we are here thanks to our fans. I think that's why we have this relationship with them." And as BTS continues to please new and old fans, the group makes it a priority to sing about some of the challenges young people face in Korea. "When I think back to I when I was younger, when I was a student, I listened to a lot of music and I think it was a way for me to escape and a way for me to sort of reassure myself. And I think nowadays teens, people in their early twenties, listen to music but we felt, and I feel that really there aren't a lot of good sounds and healthy music that they listen to that really helps them and that was a lack that we could fill," SUGA shared. "I don't think it's just limited to Korea, I think young people all over the world face this kind of similar pain, sorrows, problems. That's why we sing these songs and I think that's why our fans and our listeners can relate to our music."